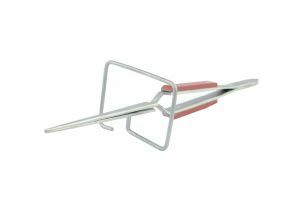 1 x straight nose soldering tweezers with stand. Tweezers are approx 6.5" in overall length. Insulated grips are approx 1.5" long. Wire stand is approx 2" x 1.5"
Squeeze to open the tweezers. The wire stand fixed to the tweezers makes it work as a third hand. Rotate the stand as you need. These tweezers are used by model makers, hobbyists, jewellers, electronics, watchmakers and craft work. The heat resistant grips will protect your fingers from heat build-up when using in soldering and welding operations.